Brian Gratton retired from the Faculty of History at Arizona State University in May, 2014. He may be contacted at briangratton10@gmail.com. The opinions expressed here are his alone. In the fall of 2010, the Arizona State University administration decided to push for the promotion of Associate Professor Matthew Whitaker to Full Professor of History. Led by then Provost Betty Capaldi (who is now ASU Professor of Psychology Elizabeth Phillips), ASU’s leadership decided he was a worthy candidate for promotion despite a mediocre record of research and publication. Perhaps they thought his adroit speechmaking and guest editorials celebrating ASU as “The New American University” made him a first-rank historian. 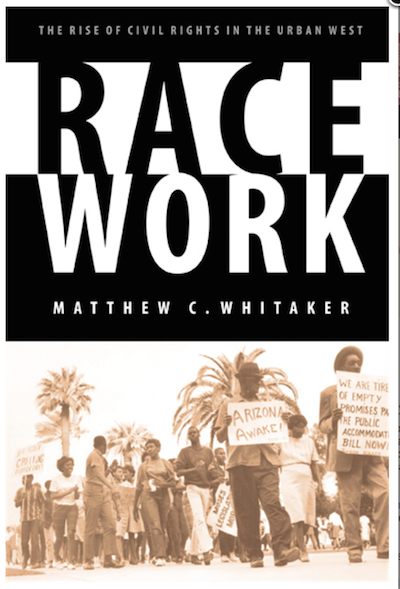 In the period after being made associate professor in 2006, Whitaker’s public vitae showed that he had not produced a research-based monograph (the standard promotion criterion for ASU history faculty). The vitae revealed no grants or fellowships, nor did it identify a single refereed article since he was tenured. It must be admitted that his c.v. did claim and still claims as “refereed” an encyclopedia entry on Muhammad Ali. Whitaker had edited two encyclopedias, including the ABC-CLIO encyclopedia in which the Ali entry appeared--perhaps he peer-reviewed himself. He had placed two chapters in collections of essays, drawn mainly from his previous, pre-tenure book, and had co-edited an essay collection in which he made minor collaborative contributions. Both this volume and one to which he contributed a chapter appeared in a series Whitaker edits for the University of Nebraska Press. There was, in sum, little since his initial promotion and tenure showing a body of published, refereed work that made an original contribution to historical knowledge. Given the lack of production, the key component in the bid for promotion, though usually not accepted as a substitute for a monograph, was a textbook manuscript, “Over Jordan,” under contract with Harlan Davidson Press, which Whitaker said was “completed” and “in production,” with a release date of December 2011. Despite this slim record, Capaldi, Vice-Provost Robert Page, and Dean of Humanities Neal Lester—none a trained historian--launched an expedited process of review, which only the administration can initiate. Presumably, they provided Whitaker’s encyclopedia entries, book chapters, and the textbook manuscript to internal and external reviewers in order that these scholars might judge the quality of his historical work. In the face of objections from the ASU history faculty, in June of 2011 University President Michael Crow approved Whitaker’s appointment as a Full Professor. Indeed, he was to become an “ASU Foundation Professor of History,” and Crow made him Director of the Center for the Study of Race and Democracy, with an annual budget of $195,000. Before this promotion Whitaker made less than $95,000 per year. His annual salary is now $155,000. Yet the composition of the committee was curious. Its members had close relations with the administration. Two were from ASU: the first, Jane Maienschein played a prominent role in the School of Life Sciences, where Vice-Provost Page had been Founding Director and Dean. The second, Eduardo Pagán, then an Associate Professor at ASU West, has since been appointed by Crow as Vice Provost “for Academic Excellence and Inclusion.” The third, John Lombardi, had begun his career as a historian but had been an administrator for decades. Though since terminated, he was at the time President of Louisiana State University. Was he the “pre-eminent historian” and university administrator whom the Provost had relied on to clear Whitaker of the plagiarism charges for the textbook manuscript? His appointment to the committee would seem to have come at Capaldi’s request, and his participation in its deliberations should have raised serious questions about conflicts of interest. Lombardi had been Provost Capaldi’s close colleague and collaborator for 20 years. Indeed, as Florida newspaper coverage from 1999 demonstrates, when he was President of the University of Florida system, Lombardi had appointed Capaldi as his Provost. The generous salary and raises he provided her contributed to protests that soon led to his and her resignations. This was the committee that exonerated Whitaker. They admitted the “clear taking of the words of others,” and they judged these practices “unworthy of the standards of his profession,” but argued that the plagiarism in it was not “systematic.” “Accepting Dr. Whitaker’s explanation,” as they stated, the committee members decided his copying was not intentional. Although the university’s student policy does not allow lack of intent as a defense, they determined that Whitaker, a professor, had not really meant to deceive. At almost the same moment, the ASU administration listed as one of the chief justifications for dismissal of another professor was that she “had plagiarized the work of other authors” in her unpublished course syllabi. Ironically, Whitaker himself admitted to plagiarism in his use of Wikipedia and other web sources, a practice perhaps most flagrant in the “Muhammad Ali” entry he still claims as a refereed essay. (An analysis of this piece can be found at Cabinet of Plagiarism.) These “regrettable errors,” he explained, came about because he had hired a “freelance editor” to do his research and writing. That paid worker had taken “verbatim sections from Wikipedia” without sufficiently “rewording them.” Somehow, Whitaker himself “did not carefully review” the entries before publishing them. The committee accepted this explanation without further inquiry. There is no indication from the committee’s report that members interviewed the editors Whitaker says he paid to do his work for him and whom he accused of plagiarism. In assessing work that had not been digitized, the committee had Whitaker carry out scans to digitize text for plagiarism checking software; they asked him to run and present his own plagiarism checks, rather than conducting all these analyses themselves; indeed, they did not require that he scan the entirety of his work, nor the entirety of the texts from which plagiarism charges derived. From the public documents, it is not clear that the committee understood its own process well enough to realize that internet software searches would not suffice for analysis, nor that they were examining Whitaker’s checks. Those said to have been done by ASU officials do not appear to be in the files, though perhaps they looked at these as well. The committee did, however, work efficiently. On 25 January 2012, the chair of the committee complained that she had not seen any of the evidence brought forth in the complaints, including the specific text comparisons and annotated plagiarized passages, although they had first been submitted by the complainants four months before (examples can be examined here and here). According to the public record, two days later, on 27 January, the committee met for the only time. On 2 February 2012, one week after its chair said she had not seen the vital documents, the committee issued its decision exonerating Whitaker. Efficiency has its costs. In an extensive response to the committee’s report, one of the professors who brought charges found that the committee did not examine all the texts brought forth as examples of plagiarism. The professor’s response asks why the committee did not investigate evidence of the possible participation of graduate student assistants, staff and others in covering up the plagiarism, though the university evidently knew of this evidence. It asked why the committee did not interview the “assistants” charged by Whitaker with having done the copying even he admitted was perfectly evident in his work. And the committee did not interview the professors who submitted the charges, despite University guidelines advising them that they ought to do so. In contrast, they attended closely to Whitaker’s explanations. Hence, plagiarism in them did not matter. The committee also refused to examine the first scholarly work found to be plagiarized, the textbook “in production” that had been central to the promotion file. They refused despite a reversal of position by Provost Capaldi, who had first relied on her “external authority in History,” to find that it was acceptable to use material copied from others to get promoted. In December 2011, Vice-Provost Mark Searle, speaking on her behalf, ruled that “we have found it necessary to re-open the investigation of the book titled ‘Over Jordan,’ ” and to include it in the ongoing review. The committee, in declining to include this manuscript in its review as well as other published material, thus failed to examine a substantial portion of what Whitaker brought forward for promotion. These writings were seen as scholarly in the promotion process, but not scholarly when they were found to be plagiarized. The redefinition did not trigger any censure from the administration, although “misappropriation of the writings, research, and findings of others” is a violation of the ethical standards of the University and “misrepresentation in securing an appointment, promotion, or tenure at the university” is grounds for “suspension or dismissal” according to University and Arizona Board of Regents’ policies (ACD204-01; ACD 508-03; Board of Regents: 6-201-J-1-b). Outrage over this decision and resulting media coverage of the flawed process at ASU (see here and here) led to pressure by the administration against some of those who protested, but no meaningful punishment for Whitaker. At his request, he and his Center moved to the downtown ASU campus. Not until 2014 did the textbook promised for 2011 appear, though not with the original publisher, Harlan Davidson. This work came out as Peace be Still from Professor Whitaker’s regular outlet, the University of Nebraska Press. According to analyses of this textbook, Peace be Still again exhibited--shall we guess?--plagiarism. Oddly placed citations responded to exactly the copied sections caught in previous complaints, but Whitaker borrowed anew from web sites and, most dramatically, from editions of the most prominent textbook in the field, The African American Odyssey by Hine, Hine, and Harrold. This plagiarism has been closely covered in the blog Statistical Modeling, Causal Inference, and Social Science, and in the web site Cabinet of Plagiarism. An Inside Higher Ed issue of 13 May 2014 also examined this issue. 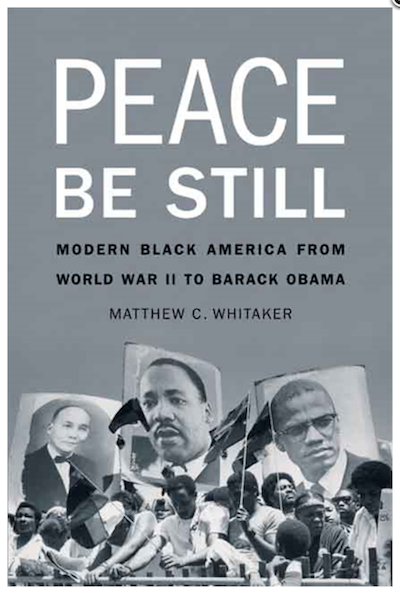 Despite evidence that Whitaker again had used the work of others for his own credit, the University of Nebraska Press has refused to withdraw Peace Be Still. This acquiescence by a purportedly scholarly press stands in marked contrast to the immediate retraction this year of a monograph by Johns Hopkins Press when it was found that its author, Vanessa Ryan, a Brown University professor, had plagiarized, albeit much less systematically. Indeed, Nebraska’s Editor In Chief, Donna Shear, presented with evidence of plagiarism, not only declines to withdraw the book but presents a defense that appears to be rather distant from commonplace principles of scholarly editing. In Inside Higher Education, Shear points out that she did not oversee the book she defends, and, though it was copy edited, it appears the press did not assign it a scholarly editor. Instead, Shear relied largely on Whitaker—whose past history she knew-- to correct his own plagiarism. As HNN reports, she claims he ran his work through a software plagiarism checker not once, but twice. The mind reels at the idea that a scholar would have to run a plagiarism check on his or her own work, if that work were actually his or hers. It staggers at the notion that this would have to be done twice. It collapses when it is obvious from the evidence that the author’s searches failed to discover obvious cases in which he copied. Nor is the operation confined to using the work of others without attribution. Even where cited, this textbook relies on semi-scholarly (blackpast.org) and unscholarly (michaeljacksondeceased.blogspot.com—now defunct) websites that undergraduates are sternly told, by their teachers and provosts’ websites, not to rely on or suffer grave consequences. Why is Nebraska willing, even eager, to sell free material? Someone at the Press may have been a tad embarrassed: the notes do at times offer an author, a title, and “unpaginated.” You must turn to the bibliography and match authors to realize that those “unpaginateds” are from websites such as politico.com. University teachers are well aware of how students who plagiarize use plagiarism software to disguise their copying, changing a few words here and there to distract the matching. Any professor knows you can’t rely on software to determine originality, even in a student essay; you have to actually read the work and apply judgment. At a press, you have to assign an editor to a manuscript to see if it has a voice of its own, or is merely a facsimile. That kind of scholarly editing might have led to awareness that Whitaker’s major source for borrowed text, primary source quotations, evidence, statistics, and, most obvious, arguments, are editions of Hine, Hine and Harrold’s Odyssey. So far as we know, these texts have never been digitized and would not, therefore, likely appear in his doubly exercised magical plagiarism checker. As Cabinet of Plagiarism demonstrates, many pages of Peace Be Still plagiarize Odyssey and other authors’ work, or in what Shear describes as “tight paraphrasing” – exhibit characteristic cosmetic changes without citation. And what on earth is “tight paraphrasing” anyhow? Is this Shear’s euphemism for a practice that, in their statements of standards of professional conduct and ethics, the American Historical Association and Modern Language Association both deem plagiarism? Does Whitaker’s use of primary source quotations and specifics from Hine, Hine, and Harrold count as tight paraphrasing? Is the Press willing to articulate explicitly its new standards for what constitutes original work, advising hopeful authors, peer reviewers, and other presses what they can get away with? Should other presses constantly patrol Nebraska’s books to defend their copyrights? Should authors run excellent works of history by other scholars through word-changing software (readily available), add a few bold remarks, and submit to Nebraska as their own, original work? The University of Nebraska Press runs the risk of selling books to students that commit the sin we warn students is mortal. It shouldn’t want to hawk as original what students can obtain for free from the web or by paying a legitimate press and author for a legitimate piece of work. Otherwise Nebraska might be on the road to becoming the “New American University Press.” Michael Crow and the “New American University” are using taxpayers’ money to finance a Center and support a professor who appears well suited for just such a press. Budget and salary figures are found in 2013-2014 State and Local Operating Budget for Arizona State University. In addition to the web and newspaper sources cited, this essay uses documents from the 2011-12 inquiry that are, by Arizona law, open to the public. Readers may request these documents by contacting Debra Murphy, Director, OKED Operations, Arizona State University, at Debra.Murphy@asu.edu.